The MX.49xx cards allow recording of up to four channels with sampling rates of 25 MS/s or two channels with sampling rates of 50 MS/s. These cards offer outstanding A/D features both in resolution and speed for PXI. The cards can be switched between Single-Ended inputs with a programmable offset and true differential inputs. If used in differential mode each two inputs are connected together reducing the number of available channels by half. The 16 bit vertical resolution has four times the accuracy compared to 14 bit cards and sixteen times the accuracy compared with a 12 bit card. All boards of the MX.49xx series may use the whole installed on-board memory of up to 64 MSamples, completely for the currently activated number of channels. Based on the CompactPCI 3U standard the PXI (PCI eXtensions for Instrumentation) enhancement was defined especially for the measurement user. In this specification additional lines for measure ment purposes are defined. 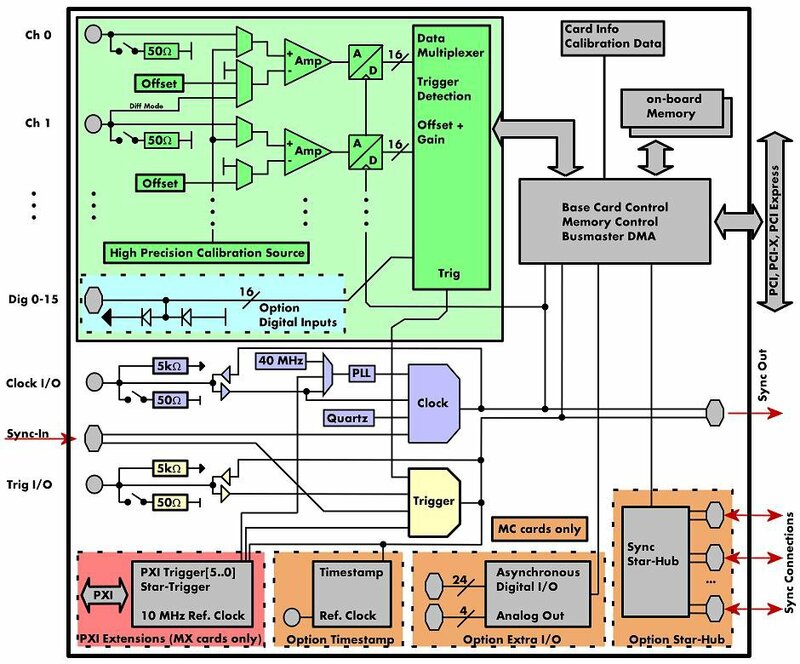 There is a high-quality 10 MHz reference clock, as well as a star trigger and a trigger bus. The Spectrum boards support all these features, most notably with the help of the reference clock and the star trigger module for an easy combination of products - in including those from different companies. Since September 2003 Spectrum is a member of the PXI system alliance. The Spectrum PXI cards run in a plain CompactPCI 3U slot as well as in a dedicated PXI 3U slot. If using the MX series in a plain CompactPCI slot the PXI features will not be available. The FIFO mode is designed for continuous data transfer between measurement board and PC memory (with up to 100 MByte/s) or hard disk. The control of the data stream is done automatically by the driver on interrupt request. The complete installed on-board memory is used for buffer data, making the continuous streaming extremely reliable. 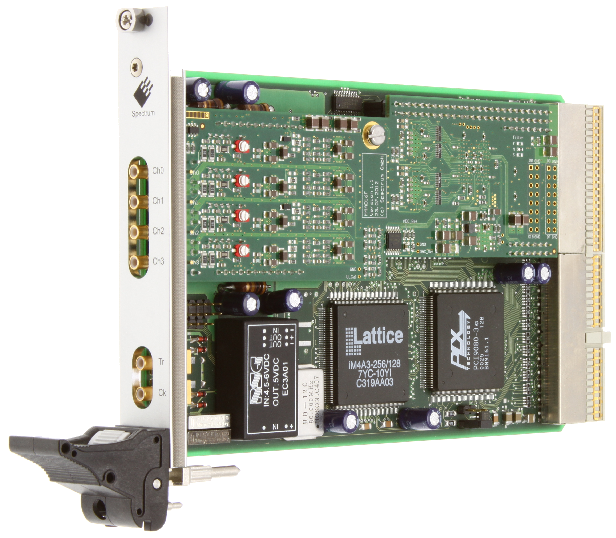 The MX.9010 is a special PXI star trigger card designed for the Spectrum PXI products. It allows to route clock and trigger synchronously to all PXI slots that are connected to the star trigger slot. The PXI reference clock is overwritten and external trigger events are synchronized to the sampling clock. The Spectrum cards support star trigger as well as the PXI trigger bus. using a simple software commend one or more trigger lines can be used as trigger source. This feature allows the easy setup of OR connected triggers from different cards. The trigger event is a slope inside the signal that is larger (or even smaller) than a programmed slope. Internally the difference of two adjacent samples is calculated and then compared to the programmed trigger level. This trigger mode allows the detection of signal distortions as needed for power line monitoring. The card is able to use the 10 MHz reference clock that is supplied by the PXI system. Enabled by software the PXI reference clock is feeded in the on-board PLL. This feature allows the cards to run with a fixed phase relation. With a simple software command the inputs can individually be switched from single-ended (in relation to ground) to differential, without loosing any inputs. When the inputs are used in differential mode the A/D converter measures the difference between two lines with relation to system ground. This option acquires additional synchronous digital channels phase-stable with the analog data. When the option is installed there are 16/32 additional digital inputs which can be individually mulitplexed into the analog data in different formats reducing the analog resolution.